If you’ve been following the Arbordexperts Installer Awards, you’ll know that North Spas took the ‘ Best of Trex ’ title with the phenomenal ‘Peffer’ project near Gateshead. 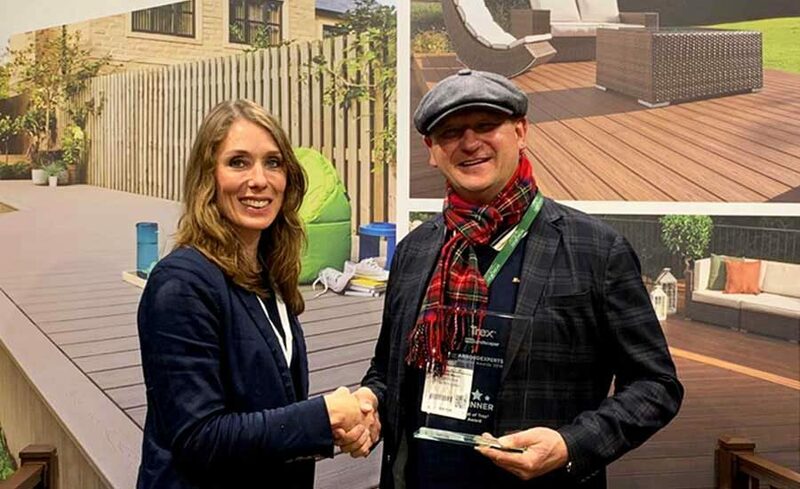 North Spas impressed the judges with the creative use of Trex decking in this multi-level project, and the company’s directors, Davy and Heather Mason are already planning their trip to Washington DC, where they will visit the Trex University as well as seeing the sights in the US capital. We caught up with Davy and Heather to find out more about their winning entry – and their travel plans, of course! Your Peffer project won the prestigious Best of Trex award as well as ‘Best Trex Design Solution’. Why did you choose to enter this project? We entered this fantastic multi-level project into the Arbordexperts award because we felt it portrays our absolute passion for what we do. Our tagline is ‘base to bubbles’ and that is exactly what this project reflects! During our initial site visit with our wonderful clients Mr & Mrs P, we identified it was important for the couple to be able to enter and exit their hot tub with ease. The design revolved around this and the deck was raised around 0.78m to allow the Santa Cruz hot tub to nestle into the bed of Trex Transcend Island Mist. 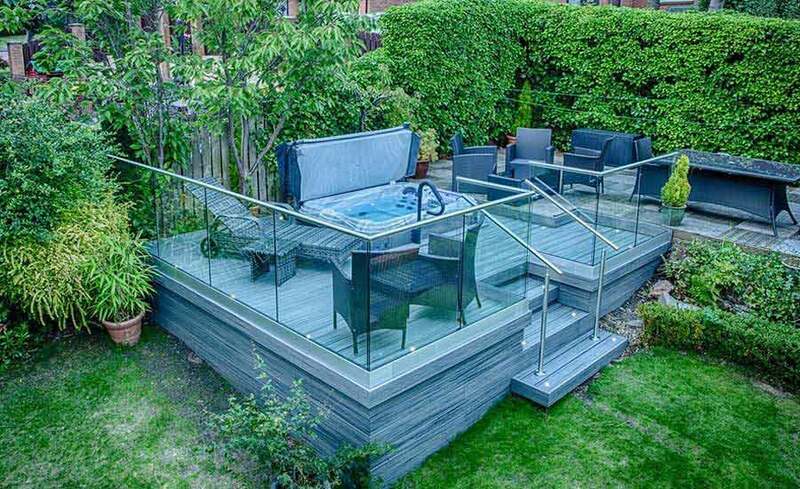 The glass balustrade surrounding the deck allows Mr & Mrs P to admire their garden right from the tropical temperature waters of their spa as well as providing a safety element. Overall, this deck is visually stunning, reflects our passion for design and high-quality materials and is enjoyed by our clients every single day! What do you think made your entry stand out? Our entry enhanced Mr & Mrs P’s garden whilst maintaining a lot of the luscious green grass and plants – something the couple were very proud of. 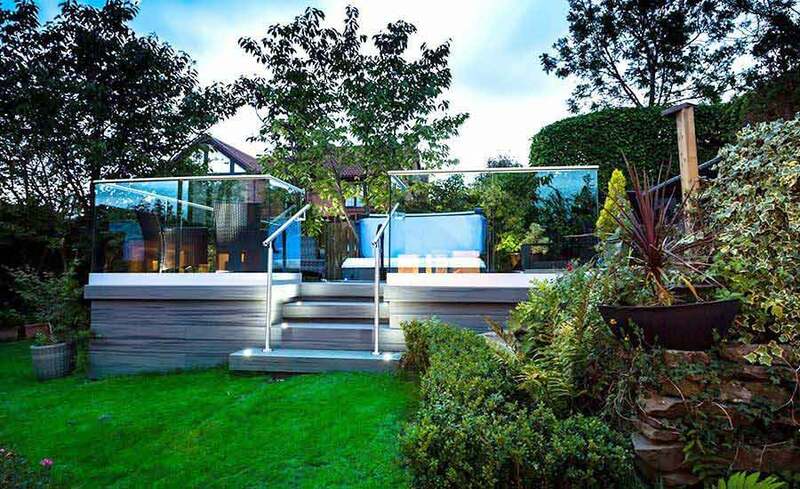 The glass balustrade allows Mr & Mrs P to soak in tropical water and admire their garden through the glass. Ease of access was a key requirement and one we met by building the raised deck to sink the spa. Our problem-solving approach created a visually stunning, practical and minimal maintenance design. The raised picture frame border around the spa actually disguises a gap in between the spa and the framework. This gap has been left for maintenance although you would never know as the picture frame simply looks like a design feature to highlight the spa! What did you think your chances were of winning? Were you feeling confident? We entered our projects as we knew Arbordexperts would be a great platform to show our intricate designs and excellent craftsmanship. Scooping three prestigious awards is an absolute honour and our whole team is thrilled to gain international recognition for their hard work. Upon entering the awards we didn’t expect to win and we certainly didn’t expect to be flying out to Washington DC! What would you say to other installers who may be considering entering the awards next year? We would highly recommend any Trex installers enter the Arbordexperts awards. It is a fantastic opportunity to promote your work, gain international recognition and grow your company. The networking event was excellent and we found it extremely beneficial to speak with other TrexPRO installers. In 2019 we are installing a garden bar for a client under our sister company North Bars. When you think of garden bars you might think of a shed with a few retro signs and a beer fridge, well, we are completely reinventing garden bars with Trex. The garden bar building will be constructed using high quality timber from Holland whilst the flooring and veranda deck will be a combination of Trex Vintage Lantern & Tiki Torch. The bar will have three working beer pumps, full electrics and bi-fold doors. If that’s not cool enough, imagine a Trex walkway from the garden bar all the way to the customer’s private lake. Garden bar goals! And finally, what’s on your sightseeing list in Washington DC? We still can’t quite believe we’re going! We really can’t wait to explore the Trex University. It will be an excellent opportunity to improve product knowledge and take lots of pictures for our Facebook pages. My (Davy) new hobby is making videos and I’ll have plenty of time to do that on the plane back! We also want to visit Madame Tussauds and see all of the American Presidents. Who knows, Davy might even practice his Trex sales pitch on Trump! We have already scoured TripAdvisor and can’t wait. A huge thank you to all for our prize. If you want to follow in Davy and Heather’s footsteps, follow us on Twitter and Facebook to be the first to find out about the 2019 Arbordexperts Installer Awards.